A musical celebration of love! Give your little one a hug, kiss, and cuddle… it’s time for our February playdates: Love Notes! 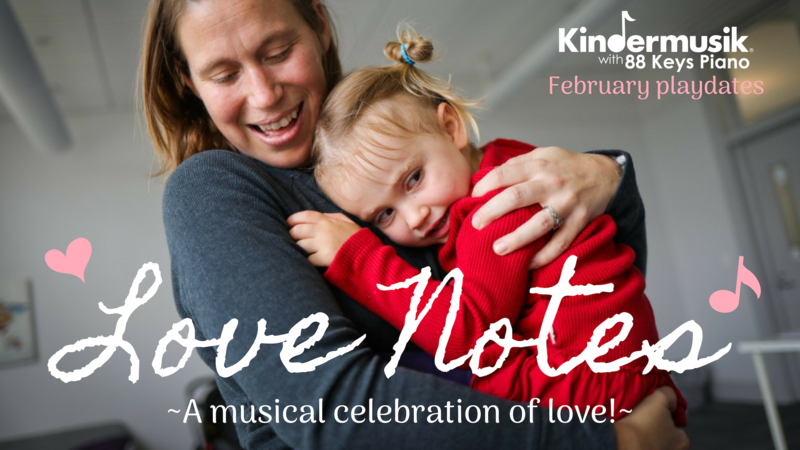 We’ll be singing, dancing, rocking, moving, and exploring instruments through this endearing, heartwarming theme that celebrates the love you share with your child. After all, what’s a better way to bond with someone you cherish than to make music together? Our February playdates will be held three times, so feel free to enroll in one or more dates. Playdates are open to children ages 0-7 and their caregivers! Spaces in each playdate are limited and tend to fill fast, particularly the weekend dates, so hurry to enroll now and save your family’s spots! Saturday, Feb. 16, 2019 at 10am – STILL ROOM! Wednesday, Feb. 20, 2019 at 10am – STILL ROOM! Saturday, Feb. 23, 2019 at 10am – STILL ROOM!